Whilst this whisky’s name might sound a little “out of this world”, the spirit itself represents a global collaboration! This is a release from Shinsu, one of Japan’s newer and lesser-known distilleries, and includes not only Japanese whisky, but whisky from a mystery Scottish distillery! Shinsu was founded in 1985, but lay dormant for many years, until it started producing whisky again in 2011. The distillery lies in the Japanese Alps, and the name “Cosmo” is shared with one of the nearby mountains. 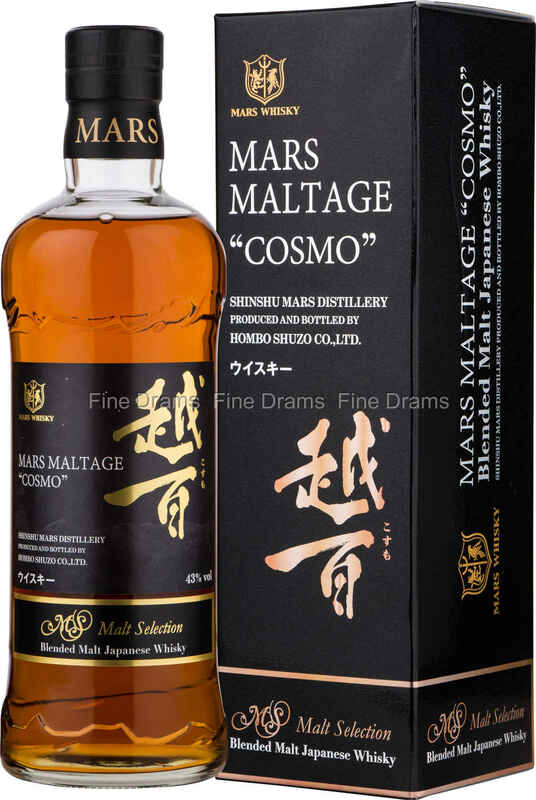 The demand both in Japan and abroad for Japanese whisky is so high that Mars Maltage decided to release another regular bottling. However, their own production was not yet large enough to be succeed in this endeavour, so the distillery decided to produce a blend. In Japan, it is something of a matter of honour not to use whisky in your blends that has been produced by a rival distillery (no such code-of-honour exists in Scottish blending), and with this in mind, the distillery turned to Scotland to complete their blend. The Chief Blender picked out the single malt he wanted to use himself, as he had in mind a specific profile for this whisky. An intriguing and delicious whisky, non-age-stated, bottled at 43% and diluted with water found from sources local to the distillery. Definitely a dram to try for fans of the more bizarre world whiskies.